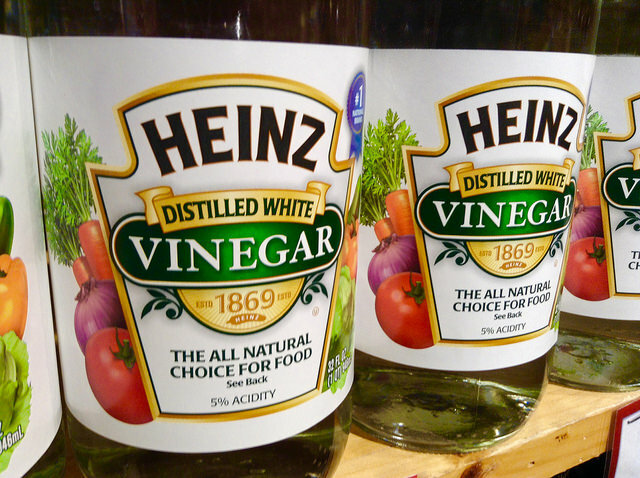 If you’re a homeowner with a septic system, or even if you just want to keep the plumbing in your home working properly, we’ve created a quick list of septic system life hacks that you can use with vinegar. You can clean and unclog your drains with these affordable techniques while protecting your septic tank because if you don’t know by now, the chemical drain cleaners you get at the store can actually harm your septic system more than help it. Disclaimer: These tips are not meant to diagnose or treat major septic system issues. You should always contact one of our experts to inspect or treat your septic system. Items Needed: White Vinegar, Baking Soda, Dish Soap. Even the dishwasher needs some washing from time to time. Simply add 1 cup to the bottom of the dishwasher and let it run for an entire cycle. This will reduce soap buildup on the inner mechanisms and on glassware. Do this once a month. This technique is for slow moving drains and minor clogs. If you’re having a heavy drain clog, we recommend you call one of our experienced technicians. For this septic system life hack, you will need 1/2 cup of baking soda and 1 cup of vinegar. First, pour the baking soda down the drain and let sit for a few minutes. Then add the vinegar. Let it sit for another 15 to 20 minutes or until the bubbles stop. Then, flush the drain with hot water. First, we should probably mention that having a garbage disposal in your home that has a septic tank is not a good idea. Garbage disposals are highly dangerous to the health of your septic system and can cause clogs and backups. If you do have a garbage disposal, there are many ways to deodorize them to keep them smelling fresh. For example, you can grind citrus peels with ice cubes such as in this Guide To Garbage Disposals. But sometimes, food can get stuck in the garbage disposal and cause some serious odor. Here, we recommend adding 1/4 cup of baking soda then turning on the disposal for a few seconds. This will mix up the baking soda throughout the garbage disposal. Then, follow with 1 cup of vinegar. When the bubbles stop, go ahead and rinse with cool water. This technique will deodorize the drain and the chemical reaction will dislodge any food items stuck in the disposal. This next hack is meant as a routine maintenance procedure for the drains in your home. Remember, half the battle in keeping your septic system healthy is through routine maintenance and prevention. If you’re having any major problems, pick up the phone and give us a call immediately. Don’t wait for a problem to get worse. To help keep your drains free and clear, similar to the unclogging technique above, you can add 1/2 cup of baking soda followed by 1 cup of vinegar. Let it sit in the drain for 15-20 minutes then run with hot water. If you seem to be out of baking soda, you can also simply just pour white vinegar down the drain, let it stand for 30 minutes, then flush with hot water, once a week. Are you finding yourself having a problem with gnats or ants in your kitchen? Take an empty spray bottle and fill 1/3 with vinegar. Fill the rest with water and add a few drops of dish soap. You can use this affordable mixture to clean your counter tops and will keep the bugs away! Use these septic system life hacks with vinegar as routine maintenance and for minor clogs. If you’re having serious issues such as septic system backups, or serious drain clogs, give our experienced technicians at Lapin Services a call. These tips are not meant as a solution to major septic system issues or as a replacement to routine septic tank pump-outs.